Ken Collins (MICA President) asked me to say a few words during the MICA business meeting tomorrow night (11/10/2014) about our amateur radio (HAM) activities on MI. Here is what I plan to say as I stand near the demonstration display board pictured below. (Larger image) I will be bringing it (or a modified version) to all future MICA meetings. The MI Emergency Preparedness (EP) Committee has divided MI into 6 Sections as shown in the large and small map on the right side of the display board. MIEP is trying to have two and more licensed Ham Radio operators in each of 6 Sections. The RED push pins show our seven (7) active HAM operators; the RED yarn depicts their communications with our MI Repeater at the WSU Extension at Twin Vista Ranch. The BLUE yarn depicts our line of communication with the JC EOC (Emergency Operations Center) and WA State District 2 ARES (Amateur Radio Emergency Services). 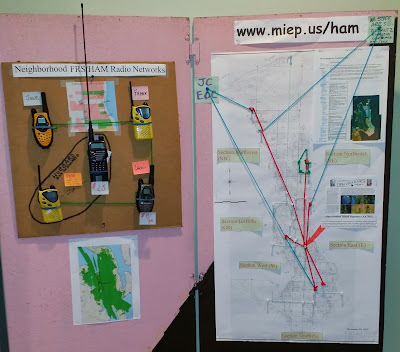 The GREEN push pins and yarn and the radio display to the left depict our plans to create numerous Neighborhood FRS/HAM Radio Networks throughout the 6 Sections on the Island. The GREEN map shows the coverage of our MI Repeater. There are handouts and templates on the reverse side of the display board. Click here to send questions/comments to Pete Hubbard.